A woman runs screaming from Freak Force’s new headquarters, the latest person to apply to become the team’s secretary. Barbaric had interrupted the interview to ask Dart about ordering pizzas and the sight of him scared the applicant off like it had numerous other people. Rapture attempts to calm a furious Dart down and drags her away for lunch. She assures her that the rest of Freak Force cannot possibly get into any trouble while they are gone and it will do Dart some good to get away from things. Mighty Man tries to convince Phyllis Deeder to agree to the secretary position but she is already dealing with enough weirdness in her life and this will just make it worse. Phyllis heads out as SuperPatriot arrives to speak with Mighty Man. He simply wishes to speak with someone from his generation rather than the youngsters that they are now affiliated with. Mighty Man feels uncomfortable by this situation as SuperPatriot has no idea that he is not the same person that he used to fight alongside. The Covenant of the Sword decides to eliminate SuperPatriot as his continued existence is an embarrassment to them after he broke free from their clutches. A group of super-freaks are assembled for this task and they are joined by Mako who is eager for another shot at the hero. 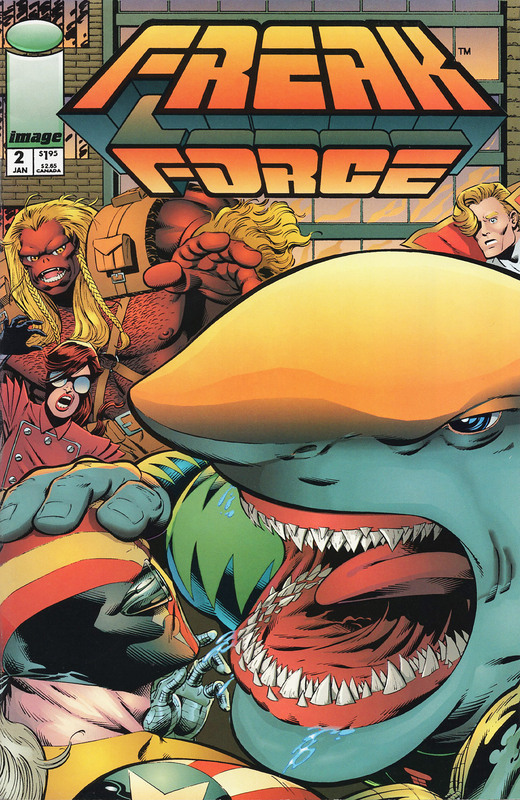 Manga transforms into a comic character and teleports his team to Freak Force’s headquarters. They announce their presence before attacking Mighty Man and SuperPatriot on the rooftop. Barbaric is growing frustrated with the treatment that Ricochet and he are being treated like mere children by Dart. He is technically an adult and both of them are more grown-up than Dart is giving them credit for. They hear a commotion upstairs and are joined by Horridus in heading up to the roof where they find their teammates under attack by the Covenant. Mighty Man is panicking in the clutches of Squid and ends up getting covered in an ink cloud that blocks off his senses while Mako is desperately trying to feast upon more of SuperPatriot. Ricochet bounces through Flux’s body and makes the mistake of slowing down enough for her opponent to pin her down. Horridus is kept busy by Manga and his various comic character forms while Barbaric is overpowered by Hive as he splits up into dozens of miniature versions of himself. SuperPatriot manages to take down Mako before knocking out Flux and then taking out Manga, freeing up Ricochet to repeatedly bounce on top of Mako to render him unconscious. After regaining his composure, Mighty Man defeats Squid with a single punch and then joins the rest of his teammates at laughing at Barbaric as he is swarmed over by Hive. The villains are all gathered up and delivered to the Chicago Police Department. Dragon congratulates them for their success although Dart heard that Freak Force did not handle themselves that well. SuperPatriot later speaks with Dart as the latest secretary applicant arrives and just as swiftly flees at the sight of the cybernetic hero. The Covenant agent that had authorized the hit on SuperPatriot is then executed for failing his mission.